During the war, civil engineer Richard P. James of Philadelphia, watched a steel spring roll off a war plant table, bounce on the floor, do a number of flip-flops, wriggle, quiver and finally lie still. As he bent to pick it up, an idea came to him. When peace came, James took his idea out of mental storage and put it to work. the result is a new toy, which from present indications, promises to sweep the country. the plaything is a plain flat-coiled spring of Swedish blue steel. Inert, the spring suggests no recreational possibilities and looks about as intriguing as any other machine part. In motion, however, it provides fascinating variations in sinuous mobility, depending on the ingenuity and dexterity of the manipulator. Named "Slinky" by Betty James, Richard's wife, the spring lives up to it's name by eerily "walking down" a flight of steps, end over end, step by step. 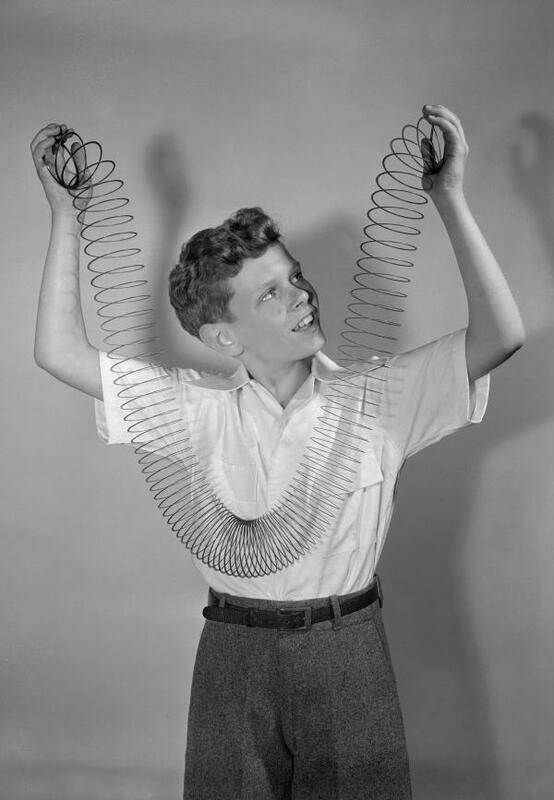 The Slinky® (under House Bill No.1893 - Session 2001, of the General Assembly of Pennsylvania) has been named the Official State Toy of Pennsylvania as of November 4, 2001.